South Asian journalist unions and associations affiliated to the South Asia Media Solidarity Network (SAMSN) and the International Federation of Journalists (IFJ) resolved to build strong, united, democratic, independent, representative and self-sustaining unions ensuring meaningful representation of female journalists and youth in decision-making and leadership positions during a meeting in Kathmandu on September 8-10. Journalist leaders and representatives of unions from Afghanistan, Bangladesh, Bhutan, India, Maldives, Nepal, Pakistan and Sri Lanka convened for a meeting ‘Credibility, Safety and Equity: An Agenda for Change in South Asia’s Media’ supported by the Friedrich-Ebert Stiftung (FES). The participants deliberated on national and regional issues affecting freedom of expression, press freedom, and journalist’s rights including impunity; labor issues; gender equity in media; internet shutdowns and freedom of expression online; fake news; journalism in conflict; safety of journalists and digital security. 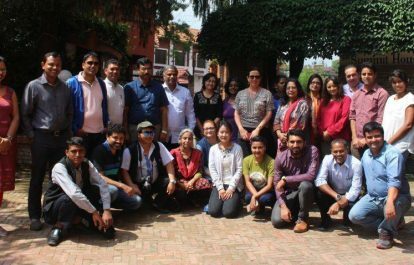 The meeting endorsed the Kathmandu Declaration 2017, which called upon governments for an urgent roadmap to ensure a safe environment for journalists and the media; ensuring robust police investigations into threats; and journalist protection acts to ensure speedy judicial procedures in cases of crimes against journalists. The declaration also urged journalists and the media to adopt holistic safety practices to ensure physical, psychosocial and digital security for journalists. Expressing concerns over the increasing trend of arbitrary internet shutdowns and censorship attempts on online communication and content, the Declaration termed internet shutdown a “violation of the freedom of expression and opinion”. It also urged governments to ensure that dissenting opinion is not punished, censored or threatened. A resolution was endorsed calling upon governments to refrain from arbitrary internet shutdowns. South Asian journalist unions also expressed solidarity with media and journalists in Kashmir, India, endorsing a resolution that condemns the attacks, arrests, restrictions on media reporting of the Kashmir conflict, and the frequent restrictions on the use of internet and mobile phones. The meeting demanded adequate measures to provide safety for media and journalists; to ensure independent newsgathering and free flow of information in Kashmir, India. Endorsing a resolution calling Twitter to account, the meeting condemned the microblogging platform for acting on the Indian government’s arbitrary request to withhold tweets and warn users of action for ‘objectionable content’. The resolution urged Twitter to respect its users’ right to freedom of opinion and expression.